The Christmas Cactus Trap is a Limited Edition Law type weapon. A lone and desolate light in an otherwise dark desert. This delightfully decorated cactus trap spins into high gear once a mouse triggers the spring loaded bait pad. They won't be stealing any gifts tonight. The Christmas Cactus Trap is a Limited Edition weapon. It was available for sale in the Great Winter Hunt 2017 Trapsmith for 150,000 gold and 1 Nugget of Nougat. The Christmas Cactus Trap acquires a 20% Power Bonus when armed with Snowball Charms. 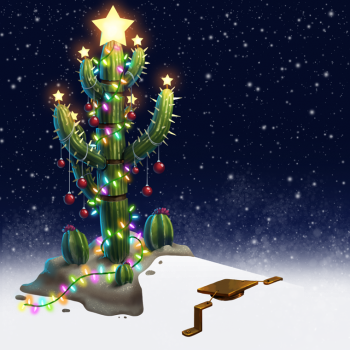 12 December 2017: The Christmas Cactus Trap was released as part of the Great Winter Hunt 2017 event.